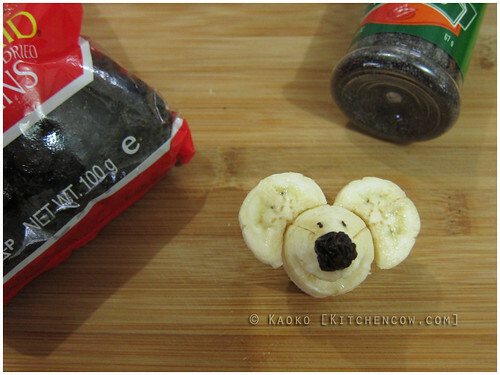 Spruce up your kid’s lunch with an adorable mouse made of bananas! Whether it’s for bento or for a meal served at home, they’re sure to love this cheeky mouse with a wide grin. And I bet you’ll love how easy it is to assemble. Start with a banana. I like short stubby latundan bananas, but if you prefer lakatan, be my guest. Note that since the lakatan is usually longer, you may actually be able to get two banana mice out of it. 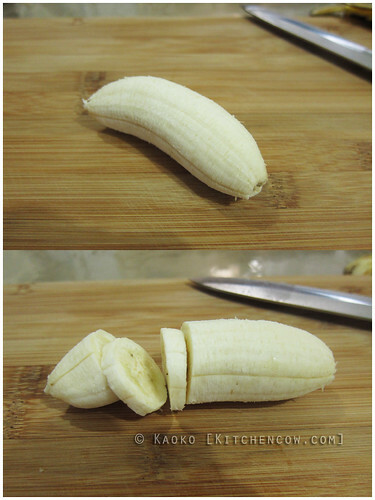 Peel the banana and set it on a flat cutting surface. 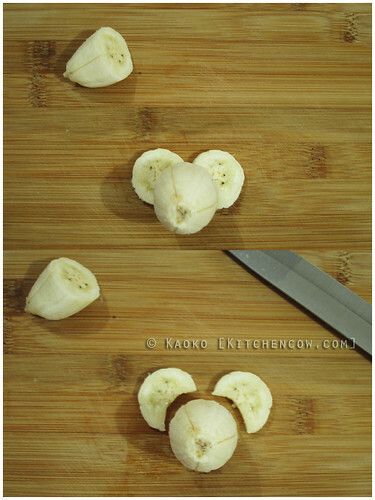 Cut off two circles a little bit past the center of the banana. These will be your ears. The short stumpy bit can go straight to your mouth. Or your kiddie’s mouth if he or she is helping you out. 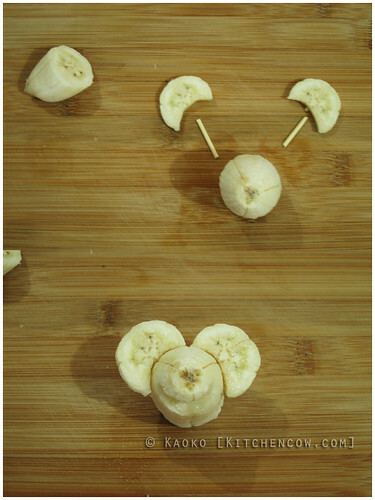 Put the banana ears beside each other, then layer the large part on top, as if you’re assembling a hidden mickey. With a sharp knife, cut off the part that’s hidden under the large banana, so you get ears that’ll perfectly fit your mouse’s body (aka the large part of the banana). Cut off two short sticks from a toothpick. I recommend cutting the sharp ends off. If your child will be eating this unsupervised, you may want to use uncooked spaghetti strands instead. Poke half a stick into the ear, then half into the mouse’s body. Do the same with the other ear. Carve a big, big smile where the mouse’s mouth should be. He should look like he’s saying ‘Cheese!’ after all. Finish your creation off with a raisin nose (the banana’s usually moist enough to make the raisin stick) and eyes made of poppy seeds or black sesame seeds. 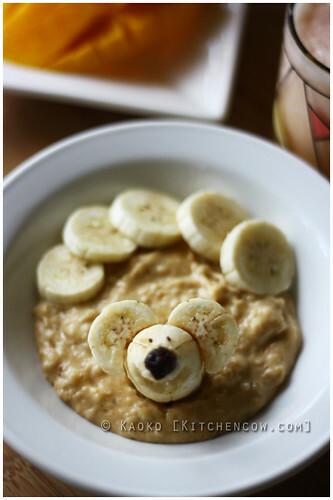 Then, release your banana mouse into your children’s food! 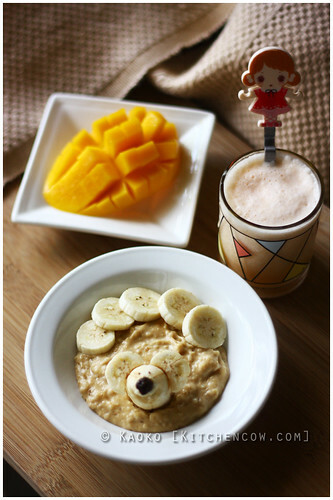 If you’re creating these banana mice for your children’s bento, you may want to dip the banana and banana slices in water that’s mixed with a little lemon or calamansi juice to arrest oxidation. It doesn’t oxidize as fast as apples, but it still browns up a bit. If you’re serving them at home, skip the dipping part. I’m sure they’ll say bye-bye world as soon as your kids lay eyes on them. If you want an easier option, you can also use banana chips as ears instead of bananas. No need to use sticks, just poke the chips where the ears should be. Quail eggs are also great for making bento mice. This entry was posted in bento, bento ideas. Bookmark the permalink. That’s adorable! I bet Miffy enjoyed this meal! Uhm… *tiny voice* I ate it. It looks yummy and easy to prepare but worry about using toothpick, your kids might eat it. uncooked pasta is still hard i think . Not as hard as a toothpick, especially when it gets hydrated by the banana. It’s an old bento trick I learned from other bento moms but I usually opt for using a toothpick. But yeah, still probably not a good idea for kids too small to know to remove it before eating.